After all the hype, hysteria and build-up we finally made it to a packed showing of Endhiran. There was a definite buzz in the air as we queued in disorderly fashion totally blocking both the main street and the exit to various shops and restaurants in the area. As the opening credits rolled, the crowd went wild, and we were off into our first Tamil film with subtitles in the cinema. The film starts well with an interestingly wigged and bearded Rajni working on his robot creation. His lab is wonderfully futuristic and his lab assistants appropriately comedic. We then had the introduction of his love interest in the form of Sana (played by Aish), and this was where the film began to lose its way. There was no chemistry between them as a couple, and the age difference was notable. Aish actually looked far too old to be playing a medical student, especially one who was too flaky to study for her exams. Scenes between Rajni as Vasi (the scientist) and Chitti (the robot) were generally done well and conveyed the growing tension in the relationship between the man and his creation. Rajni’s performance in both roles was very polished and often compelling. Again though, the lack of chemistry between the leads undermined this as the plot hinged on Chitti falling in love with Sana and that failed to be really convincing. Once love drives the man and robot apart , the film turns into a revenge action drama and the pace picks up. Danny Denzongpa makes a welcome return as Dr Vaseegaran’s old teacher, and current rival in robotics. He makes some fine points regarding ethics and behaviour, and seems to have more of a grasp on what it means to create sentient life than any of the good guys. Unfortunately he seems to be much less well funded than the lone scientist Vasi, and this leads to some bad choices in his associates. The film tosses up some really interesting ideas and questions, but fails to expand on or answer them which was frustrating. The scene where Chitti rescues people from burning buildings had so much potential to expand on the theme of the value of life, but instead just served to point out how far removed from the realities of life the scientists had become. The effects in general were really well done, but even for a sci-fi film like this there just seemed to be too much reliance on clever CGI and not enough on actual story. For example, in the fire scene the robot could fly with no obvious means of propulsion and despite being hot enough for his silicone skin and clothes to burn away, his metallic frame wasn’t so hot that it burned any of the people he helped. It was obvious that the artistic vision didn’t extend to any basic logic or science. Once we got to Chitti 2.0 the pace did pick up and the story did consolidate into a straight good guys versus bad guys. Rajni has a great line in evil laughs and his evil strut was a crowd favourite. The production design was excellent and the appearance of the various lairs, labs and other locations suited the theme of the film. The basic question of why Chitti didn’t have the same rights as the men around him was never addressed, despite that being the reason for him turning to the dark side. Instead, we got more CGI and more Rajnis – not necessarily a bad thing but it did go on for longer than it needed to. We did love the snake! Once all the whizz bang technological effects were done with, the film failed to really reach a conclusion. It seemed that all the surviving characters would just go on with their lives as though this little episode had never happened. It was quite disappointing and not satisfying at all after so much build up and excitement to leave the film with no clear conclusion. The songs were generally well placed in the film and were beautifully shot. The outdoor locations were stunning with some excellent use of local fauna. Aish’s outfits were beautiful and the costumes in Kilimanjaro do deserve special mention for the total exuberance of feathers. Heather says: While I did enjoy this film I thought it could have benefited from longer in the editing room. The film seemed to be a collection of good scenes which were drawn out a little too long and too many ideas which were never fully developed. The story had a tendency to lose its way when the focus was on the romance between the two lead characters and this tended to lose my attention. Rajni however was fantastic and his scenes both as the scientist and as the robot worked very well. He was always the main focus of attention in any scene and made the most of his double role. His assistants provided most of the comedy and I found them to be very funny and also quite well utilised in the story. I’d been playing the music for weeks, and liked most of the songs. Watching the film, even the two songs I hadn’t really liked on the CD worked well and although the dancing was perhaps a little lacking the locales and costumes were elaborate enough to make up for that. I really didn’t like the bad medicine in one scene – always a pet hate for me, and even some of the physics was just a little too hard to swallow. But then again it was a sci-fi film and not meant to be taken literally! On that sci-fi note, the special effects really were special. Overall the CGI was impressive, and the robot scenes in particular were very well done. They did seem to get a little carried away towards the end, but the film did have enough of a futuristic feel and justifies at least some of its apparently massive budget. Perhaps I just expected too much from a Rajni film, and it failed to be as good as anticipated. But I did enjoy the film and with a little more thought on the editing felt that it could have been excellent. In this current version, I give it 3 and 1/2 stars. Temple says: There was a lot I enjoyed about Endhiran but also a lot that left me cold. Rajni is the superstar, and he certainly dominated the screen whenever he appeared. He had to carry the whole film, and managed to make the biggest scenes and the smallest moments compelling and memorable. He was ably assisted by his wig designer! The first half of the film just dragged, and spent far too long on the unconvincing Rajni/Aish relationship. Aish’s acting was poor throughout, but having seen her give excellent performances in other films (Ravanan, Raincoat, Kandukondain Kandukondain, Devdas) I place a lot of the responsibility for that on a weak character/script and on the director. The second half of the film was much more successful and more enjoyable. 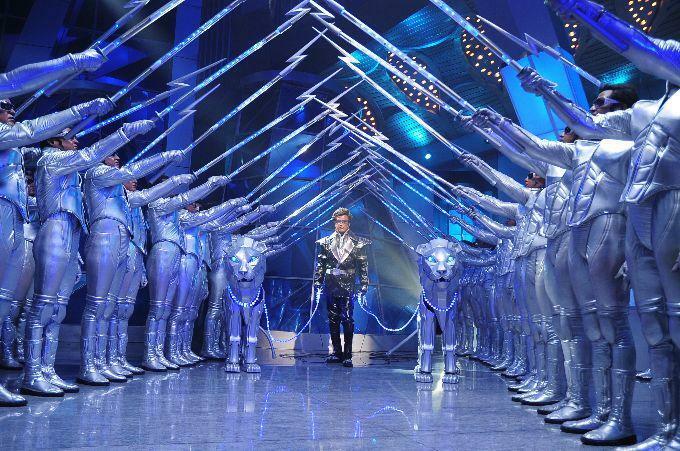 It was clear that Shankar has been “inspired” by many other blockbuster films, and seemed determined to use scenes from many of them in Endhiran. This collage effect was spoiled by the lack of linking episodes and dialogues so it became a bit disjointed and messy. I can’t even begin to explain the mosquito skit. 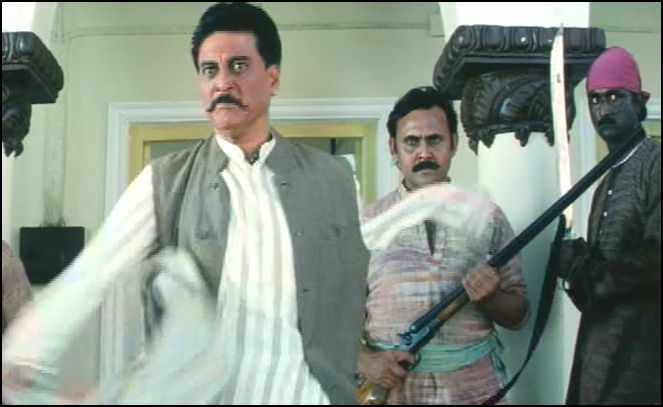 The supporting actors are good, and it was great to see Danny Denzongpa back as a villain of sorts. I didn’t like the music before I saw the film, and thought that might change seeing the songs in situ. It didn’t. I still don’t like the soundtrack much at all, and found it boring despite the excellent production design for the song picturisations. With a good edit, and a bit more thought for the story, this could have been brilliant. I give it 3 stars. This entry was posted in Kollywood and tagged A.R. Rahman, Aishwarya, Danny Denzongpa, Endhiran, Kollywood, Rajni, Rajnikanth, Shankar, Tamil. Bookmark the permalink. Thanks for the review…was a bit upset that I wouldn’t get a chance to see this on big screen because I thought it had such potential ( even though I am not a fan of the soundtrack either )…good to know I can just wait for DVD.